The former Shelbourne player has spoken openly about his problems of late. 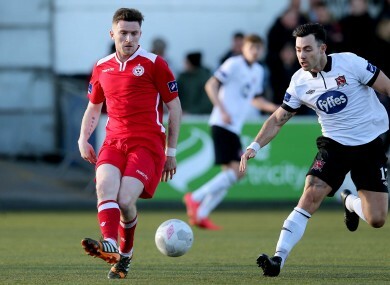 Craig Walsh (left) pictured up against Richie Towell during a 2015 FAI Cup match between Dundalk and Shelbourne. FORMER SHELBOURNE, UCD and Bohemians midfielder Craig Walsh has spoken out about how a gambling addiction led his life to spiral out of control, prompting a “one-off” incident where he took cocaine while drunk. It was announced last Friday that the player had been banned for one year after he tested positive for the presence in his system of benzoylecgonine, a metabolite of cocaine, following Shels’ 0-0 draw against Cabinteely in the SSE Airtricity League First Division on 5 September, 2015. The Dublin-born midfielder was initially handed a two-year ban following the positive test, though the punishment was reduced to one year after the panel took into account the severity of his gambling addiction and the 35 counselling sessions he underwent in a bid to turn his life around. As time went on, I was struggling a bit and I was struggling with Bohs — that’s when I knew I had to knock this on the head and I was able to address it. But then in January 2015, when I signed for Shelbourne, that’s when it spiralled out of control. That’s when I got a job working in a bookies’ firm. I thought I was in the know and that the gambling wouldn’t go on to affect me the way it did. “As the season went on, I couldn’t control it… I didn’t know how to address that I had a gambling addiction and couldn’t admit it. I was lying about it and it built up until the events of 3 September 2015. “I was struggling in previous weeks and I decided to go on a binge. It led to me losing in excess of 1500 quid, which would be three to four times what I was earning (weekly) between playing football and working. The 24-year-old ex-Ireland underage international said he was deeply regretful of his behaviour and insisted that the drug-taking was out of character. “I do accept full responsibility that I shouldn’t have done it. It was a small error of judgement that led to big consequences. I wasn’t expecting to see the Sports Council of Ireland send in anti-doping testers on the Saturday night. “I also probably should have pulled out of the match if I knew the bad state I was in. Walsh recalled how following the consumption of the cocaine, a few days later, his teammates in the dressing room “would’ve seen my face drop” when the anti-drug testers called him in for testing following Shels’ match. I wasn’t aware of how long it stays in your system. Obviously, it’s a class A drug, but I wasn’t aware of how damaging it would be to my career. During his rehabilitation, Walsh has spent more time with his family, having become isolated from them amid the addiction, taking his younger sister on a trip to Orlando, Florida recently. In addition, through the support he has received from the Professional Footballers’ Association of Ireland and the counselling he has undergone, Walsh says he is now a reformed character with the potential to be better than ever as a player as he begins the search for a new club — his ban is set to officially end on 4 September. When I get back, I think people will see the potential that I have, because I don’t have anything to hold in, I’ve nothing to hide anymore. Email “'I was getting 200 quid a week, I thought why not turn it into 400 or 600 quid'”. Feedback on “'I was getting 200 quid a week, I thought why not turn it into 400 or 600 quid'”.